Please provide more details and add some screenshots, if possible. We have column descriptions which are one type of code instead of it we required to show the other name but when we use the Specified order option then we can to able to use the customize group option. Attached snapshots for your reference. 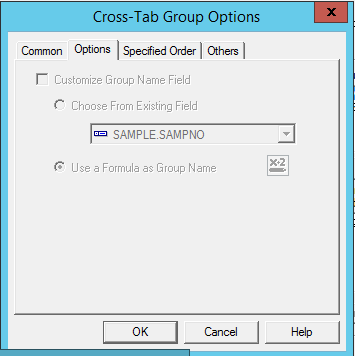 You should insert the Group on the "name" field and then set the specified order. You can't group on the "code" field and then use specified order + customize group name. We are using the "Code" field because the name field is not unique and would definitely get duplicated in the report so we are using the "Code" field in the column. Can we use specified order + customize group name together. What are you trying to do with the Specified Order grouping? Manually order groups one by one?